The loss of the beam wing is significant to the teams as not only did it provide structural integrity for the rest of the rear wing but also aided in the flow structures created by the diffuser and upper rear wing elements. 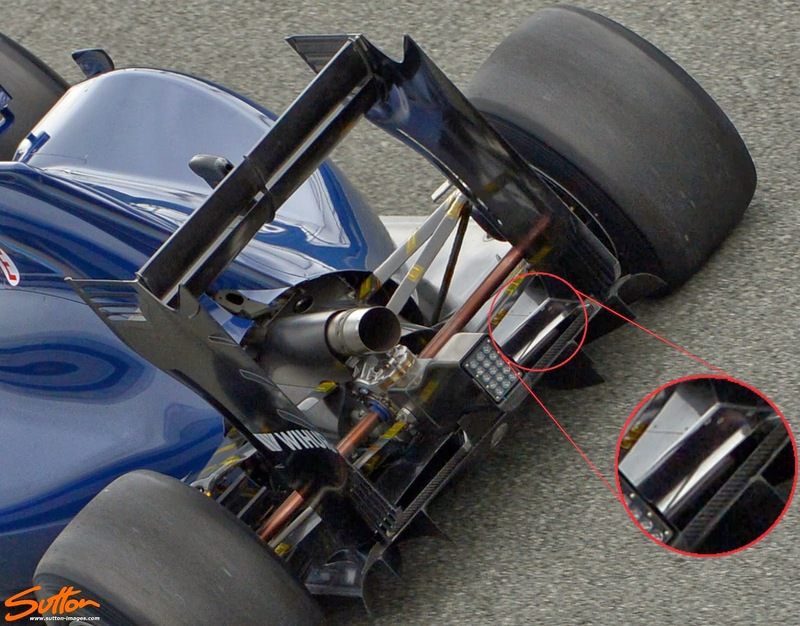 Williams have attacked this by placing a lower beam wing at 150mm above the reference plane, the height we usually find the floor, thus robbing a small amount of diffuser expansion as the floor sits slightly lower to suit. This does mean that the Diffuser's angle of attack has likely had to be made more aggressive to fully extract it's implementation but one will counter balance the other. Furthermore the team have recessed the Gurney trim around 10mm, as it usually extrudes vertically at the diffusers edge, this increases the small low pressure zone behind the Gurney leading to more counter rotating flow, aiding in diffuser performance.